There are two types of rock album in this world. There�s those instantly gratifying beasts whose very open chords immediately penetrate some care part of the psyche, flooding the soul with a sense of euphoria as though in the throes of some magical reunion with a part of yourself you never knew existed; the kind that compel you to throw your arms in the air and yell, "Yes! This is IT. Where have you BEEN all my life?" So yeah, there�s those kind, and then there�s other kind, those oh-so-subtle beats whose roar isn�t so much instantaneous and ferocious as it is a snarl, a growl that eventually explodes into a mighty cry, the way a rogue spark from a cigarette crackles and devours its way through a forest until the whole thing is set ablaze in some glorious wall of fire. 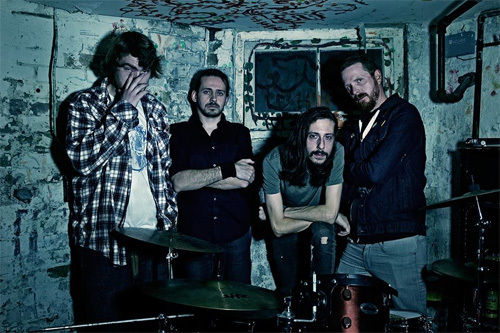 If there�s anywhere to put the self-titled debut from Canadian groove demons Headloss, it�s definitely the latter camp. Getting underway with the meandering desert-rock trudge of Hollow, it�s fair to say that the band hardly come out swinging. Sounding in brief moments like early 90s Bush busting out a slow jam after a date with mary Jane, it�s not that Hollow is a terrible track in and of itself, it�s just not quite the kind of captivating first impression you�d hope for from a band who otherwise sound like they�ve invested their heart and soul into their first full-lengther. This is especially true when you consider that there�s much better stuff from the group just around the corner. 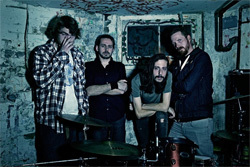 Take second track, Borders for example, where a crisp, clean guitar is sliced and diced by a high pitched solo before being swallowed whole big a dirty, ravenous riff that brings up thoughts of Kyuss and their descendants in QOTSA. If your writer had his way, the latter two tracks would certainly switch places on this album. Still, if mere track placement is all there is to grumble about, things can�t be that bad, right? From the short, bass-driven, desert blues jam of Confession through to Hey You, where a scuzzy undercurrent finally gives way to an all out psychedelic freakout, there�s a lot to make this well worth a few repeated listens. Elsewhere, the eight-minute monster that is Been a Long Night seems to work its way back and forth through the whole album, snatching up a bit of fuzz-infected bass here, a gallon of groove there, and plucking hypnotic solos from any track willing to surrender them. That done, Been a Long Night bleeds the whole thing together into some beautiful collage of sound that really makes the most of the �live� environment the LP was recorded in. And as that track gives way to the next, a funny thing starts to happen; things get a hell of a lot better. In a way, it�s as though -having realised what they�re capable of with Been a Long Night- Headloss discover a new sense of creativity and a lust for life which manifests itself in the album�s two final tracks proper, both of which just happen to be much superior than anything that went before that game-changing eight-minute epic. Surely this has to be a sign of good things ahead for the band. 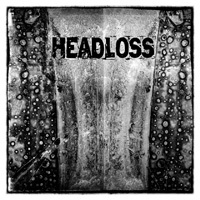 For though they may not have made the greatest first impression ever recorded, the band certainly left a memorable one with their finale, finishing up strong in a way that makes this reviewer excited to hear what�s next from Headloss. Canada�s Headloss make a strong effort with a debut that may not make a great first impression, but certainly grows into a dirty, bluesy, groovy behemoth of an album.